2008; 406 pages; 158 chapters. Genres : Action-Crime; Airport Novel. Overall Rating : C.
When two families in Washington D.C. are hacked to pieces with machetes, it's up to Detective Alex Cross to track down the killers. And he's determined to do so, since one of the victims is his ex-GF. The trail leads to Africa, where the tables are turned, and Cross finds hinself treading on the home turf on a lethal, well-connected foe. Not enough action in the last book you read? Then this one's for you. It's no exaggeration to say that every page has some sort of killing, beating, shooting, chase, or other assorted danger. It's also obvious that Patterson wanted to write about the plight of Africa, a continent that seems to be cursed by God. He manipulates the story to take Cross to places like Nigeria, Sierra Leone, and Darfur. He also manages to avoid blatant stereotyping. Our hero is a black cop, raising two kids, and living together with his GF. And Al-Qaeda terrorists don't get blamed for any of killings. OTOH, there are some serious lapses of believability. Two families get the benihana treatment, and the CIA says, "Back off; we'll handle this"? Sorry, but that would never happen. Then Cross decides to handle it on his own (cliché!) and flies to Nigeria, but without seeing any need to contact the authorities there for help? Uh-uh; not a chance . Finally, there's the Ultimate Evil himself. Most of the foes in the earlier Alex Cross stories are complex, crazy, and diaboloically clever. Our UE here has all the personality of Idi Amin. The Bane of Authors - Airport Novels. The best way to read this book is as an airport novel. Pretend you're boarding a plane; shut down your brain; and go with the flow. You'll be done in no time - the PCQ ("Patterson Chapter Quotient") here is about 2½ (406 pages ÷ 158 chapters), and half of each Chapter Title page is blank space. If you try to read it as anything else (say, as a piece of literature), you'll rate this book very low.. 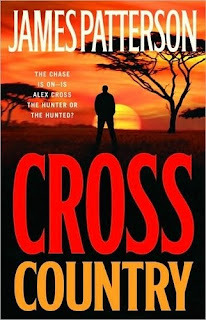 So I'm giving Cross Country a "C", because it was enjoyable escapism, and because Patterson deserves kudos for trying to give us a glimpse of the horrors going on in Africa. But if you've never read one of Patterson's Alex Cross books, this is not the one to start with. Instead, pick up Pop Goes The Weasel, Jack And Jill, or Along Came A Spider to see how good of a story he used to write. I admit, I'd never heard of James Patterson until the most recent book carneval giveaway, where a couple people were giving out a book called Sundays at Tiffany's by Patterson and another author I dont' recall right offhand. It was a romance with a twist - the love of this woman's life turned out to be her childhood imaginary friend. I won a copy of this book, and have yet to read it. I got the impression though that Patterson was a romance writer. I started seeing lots of books by him around everywhere (which I admit makes me a little leery about Sundays at Tiffany's). Interesting to know he does crime fiction, too. I'll have to shut off my brain a bit when I finally get to his book. I loved the "Airport Fiction" comment. The first time I read Patterson, I was stuck in an airport without a book and it was the only thing that looked interesting at the newstand. I had it finished by the time I landed. I enjoy Patterson, but only when I need a quick break from my other reading, and typically that coincides with a vacation and an airplane! I recently reviewed 7th Heaven. I now have the Seventh Heaven theme song in my head. Kind of pathetic that I know it, yes? kewl 7th Heaven review, Kerri. i haven't read any of his Women's Murder Club books. he lost me with his Maximum Ride series, although in retrospect, perhaps i was missing who his target audience was in those. airport novels are lowbrow, but they serve their purpose. i guess the dean of airport novels would be Clive Cussler, but the one book i read by him didn't impress me. I think there's a joke circulating the internet about cop movies like 48 Hours and the Lethal Weapon series which poke fun about how these movies circumvent actual protocol and rules and regulations. My husband loves to watch those movies and point out the errors of their ways. It seems Patterson has fallen into the same trap. I know they've turned the Women's Murder Club into a TV series (is it still on?) with the former ADA of Law and Order, guess it shows I haven't watched it, but it sounds or sounded intriguing. Amanda - all things considered for the last week, the Seventh Heaven theme song is probably a blessing right? IF it's any comfort, I know all the words to the Fresh Prince of Bel-Air, and Saved by the Bell. Way more shameful. Well, I wouldn't have come back if I'd known I was going to get Fresh Prince stuck in my head!! LOL. Patterson's first two Maximum Ride books ("When The Wind Blows" and "The Lake House") were just plain terrible. the next three were a bit better, but aimed at young teenage girls, I think. and you still needed to shut down your brain before reading. all in all, he should stick with Crime stories.